Off the cuff, that seems to be how my days are going lately, lots of fun, limited focus. This weekend found me playing with scraps and bits and making coffee cup cuffs for an upcoming guild project. A perfect project to get me through my limited sessions with the sewing machine and have something finished in the end. I used the Fast2Fuse double sided stiff interfacing as my batting, and a template from a cuff that I know works. Trace around the template with a sharpie-its what I had closest to me. I then cut the interfacing into sections with about 3 or 4 cuffs in a section. This is easier to handle in the machine. Ever-so-lightly fuse in place. It would probably be wise to have a piece of parchment paper or a silicone sheet under the piece to prevent fusing to your ironing board, I was living dangerously. Then take it to your machine and quilt it, have fun, doodle or play with your fancy stitches. Now check and make sure that all strips overlap. Oops. That is an opportunity to embellish. Simply topstitch another strip over the exposed interfacing. I was also making a blue set with strips of the frayed edges of the fabrics, and had another oops. I absolutely love the patch on this one! It is an old ad transferred onto fabric. Following the template lines on the back, cut the cuffs apart. 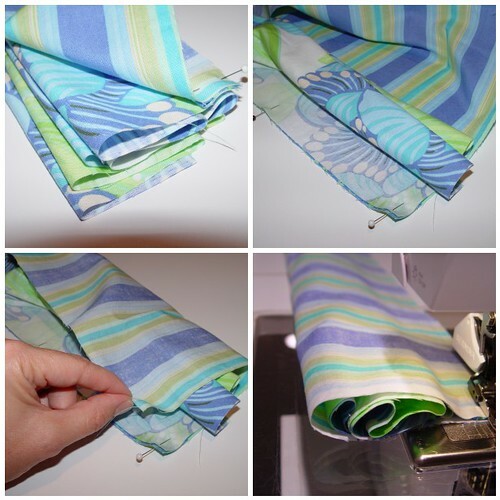 Lay the cuffs on the wrong side of the fabric that you want to line them with, slightly spacing them apart. Press with a hot iron, from the top. It takes a bit for the heat to get through the thickness to the back, be patient and careful not to scorch the fabrics. Once the fabric has begun to stick, flip it over and press from the lining fabric side. Cut cuffs apart along the edge of interfacing. (I tried leaving a slight edge, so that when I zig zagged the edges it would fold over to cover the interfacing, this was not always successful) Now is a great time to add additional scraps or fussy cut pieces to help make the cuffs unique. The top stitching helps to anchor the lining fabric to the interfacing, too. Next step is to zig zag the edges. I use various width and length of stitches and go around twice instead of using a satin stitch, just my thing. You can play around with having a different color of thread in your bobbin as well. Hope that you can have a little fun with this tutorial. My mind is already going crazy with more ideas, wouldn't a cuff made out of selvages be great? Enjoy, and let me know if you try it!! Let's just say that I tend to be experimental to the bitter end of getting a quilt done. But there are some things that are consistent in getting the binding done. I thought that I'd share those here in a tutorial of sorts, the way that I do them, certainly not the only way. I cut my binding strips across the width of fabric in 2 inch strips. I pin the strips to join them at an angle, to reduce bulk. Sew in a straight line from the upper left corner to the lower right corner. Trim 1/4" from seamline - take the triangle off, and press to one side. Join as many WOF cuts as needed to bind your quilt, into one long strip. At one end of your strip, cut a 45 degree angle. It's hard to explain, but the longer edge of the binding needs to be the side that will be against the quilt when you sew it on. See the photos in the next few steps. Turn and press under a 1/4-1/2" along the 45 degree angle. Press the binding strip in half, lengthwise. And go ahead and trim off that little triangle. If I am planning on finishing the binding off by hand, I sew the binding to the front of the quilt. If I am planning on doing it all on the machine, I start by stitching it to the back of the quilt. This is where some of the experimental part can come in. In other words, your choice, see what works best for you. I begin pinning the binding down in a random spot, kind of eyeing to see that the seams of the binding strip won't land on a corner. I think that pinning in rather crucial to the binding not getting wavy when its done. I lengthen my stitch by 2 lines (on my Bernina), and sew with a scant/skinny 1/4" seam. Hop over the edge of the binding angle by about an inch, and then start sewing again. If you miss the hop, you can unstitch later. Continue sewing to the corner. I stop about 1/4" from the edge and take a few back stitches. I used to turn and sew off to the point, but I find that just stopping works better for me. Fold the binding away from the quilt and then back on top of itself to make a tidy corner. I begin sewing from the very edge of the corners. When you have made it around the quilt and are coming up to the open tunnel of the binding beginning, continue pinning the binding down. Trim the binding long enough to neatly tuck inside the binding tunnel, without too much excess bulk. Finish pinning and sew the binding down, overlapping with the beginning stitches. Now that the binding is on, I take the quilt to the ironing board and set the seams. Then I press the binding to the edge of the quilt, turn the quilt over and press it down where I will be stitching it. If I am going to stitch it down by hand, I use the hair snap clips to hold it in place. If I am going to stitch it down by machine, I use straight pins, and pin parallel to the stitch line. Stitching it down by machine is quick and durable through many washings and tugs of use. I have used the basic straight stitch, a blanket stitch, zig-zag, and other decorative stitches to finish it off. I generally prefer that my thread match the binding, and the bobbin thread match the backing. Im usually tired at this point, and nearing the home stretch, I really don't want my stitching to stand out. I'm looking for done. I stitch very close to the edge of the binding, and continue using a longer stitch, as I had earlier. If you are so inclined, hand stitch the binding at the joining area. If I am doing all machine work, I usually pass on this, it's so tight and full, it's not going anywhere. And another project is d-o-n-e.
My local Quilt Guild recently had a program on Last Minute Gifts. I am a big fan of giving pillowcases, so I thought that I'd do a tutorial on how I make mine. I use French Seams so that all edges are finished. 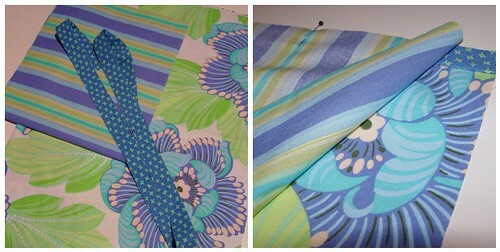 Accent strip - Blue Graphic - Cut 2" x width of fabric, press in half, wrong sides together. Trim all pieces to 40" wide. Pin the accent strip and the cuff piece to the floral body, right sides together, along a 40" side. 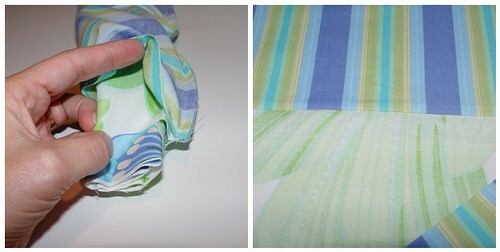 Fold the body of the pillowcase back and forth, so that the cuff fabric may wrap around this 'roll', as shown above. Align the other 40" side of the cuff with the pinned edge, and carefully pin this layer in as well. Using a walking foot, seam together with a 1/4" seam. Pull the pillow body 'roll' out of the seamed cuff. Press the seam in the cuff from the front and the back to get a crisp cuff. Now, pin the pillowcase together along the open side and bottom, with the wrong sides together. I fold a tiny corner down along the top edge to help keep the seam clean when finished, see the last photo. 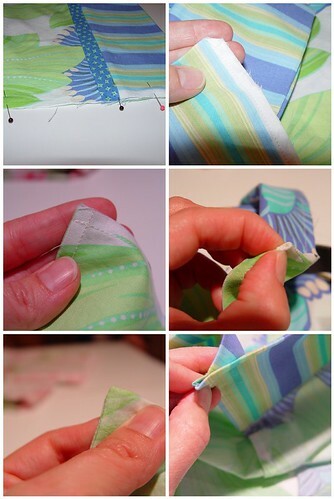 Sew a scant 1/4" seam. When you get the the lower corner, sew off the edge. Beginning off the edge, sew across the bottom. This will serve as a folding guide when you turn the pillowcase. Fold seam allowance along both stitching lines and turn the corner wrong side out, using the stitching line on the other corner, do the same thing. 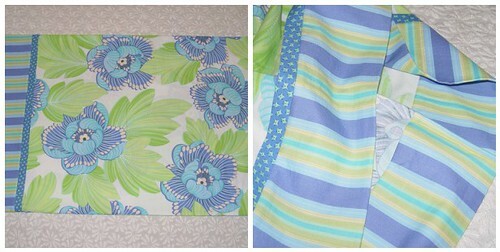 This will aide in getting crisp corners on the bottom of your pillowcase when done, see bottom photo. Now with the pillowcase inside out, carefully press the seams as crisp as possible. Take it back to the machine and sew a generous 1/4" seam along the side and bottom of the case, simply turning at the corner. Turn right side out, and your done! I hope that you enjoy, please let me know if you have any questions!